Syria Daily, Dec 8: Israeli Airstrikes at Damascus International Airport & Near Lebanon Border? 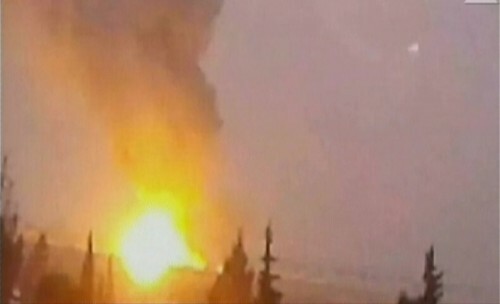 Israel has apparently renewed its airstrikes inside Syria, striking facilities that could be holding advanced missiles. Syrian State media reported Sunday afternoon that Israeli jets had struck Damascus International Airport and the town of al-Dimas, close to the Lebanese border. In line with their standard policy, Israeli officials would not confirm the attacks. Israel has periodically carried out airstrikes over the last two years, hitting a “scientific research facility” near the capital, warehouses in Latakia Province in western Syria, and convoys moving towards Lebanon. The aim has apparently been to prevent movement of missiles, possibly into the hands of the Lebanese organization Hezbollah, which is allied with the Assad regime. The exact target of Sunday’s strikes is unknown. Excited but unsupported chatter on social media was claiming that it could be Russian S-300 anti-aircraft missile systems. Others have speculated that Hezbollah’s arms depots in Syria were attacked, or that Israel was trying to blunt Iranian activity. The Foreign Ministry sent letters to the UN Secretary-General and the Security Council complaining about “a heinous crime against the sovereignty of Syria” and repeating that Israel was “extending help and support to the armed terrorist groups”. Salih Muslim, the leader of the Syrian Kurdish Democratic Union Party (PYD), has shed light on the deal for US support for the besieged Syrian Kurdish center of Kobani. Muslim that the PYD promised that arms sent by US to fight against the Islamic State would not be transferred to the Turkish-based Kurdish Workers’ Party (PKK). The PKK, which has pursued an armed struggle against the Turkish Government for decades, is listed as a terrorist organization by Washington. We are also not against improving relations between Kurds and Turkey. We only wish that Turkey was with us against ISIL. If Turkey had been, everything would have been different for Turkey, for us, and even for all people in the Middle East. We are the ones who want al-Assad to leave the most. We are on the same page as Turkey about this. Turkey, however, wants to achieve this goal by supporting the Salafi groups, which we are against…. We are ready to serve in all capacities as long as Turkey recognizes our existence and our identity. Insurgents and regime forces have been battling for weeks in and near Sheikh Maskin, which lies on the main road from the capital to Daraa and the Jordanian border. Three more Lebanese soldiers have been abducted by gunmen near the Syrian border. The soldiers were reportedly seized on Monday morning in the town of Brital in the Bekaa Valley, after the attackers infiltrated an army position. No group has claimed responsibility, but the abductions follow Friday’s execution of a Lebanese policeman by Jabhat al-Nusra, in retaliation for Lebanon’s detention of female relatives of Syrian fighters. The Islamic State and Jabhat al-Nusra have held almost 30 members of Lebanon’s security forces since fighting in and near the border town of Arsal in August. Four soldiers and policemen have executed. Qatar’s Foreign Ministry announced on Sunday that it was ending its mediation of the hostage crisis after the execution killing of policeman Ali Bazzal, saying its efforts had failed.